Beautifully engraved SPECIMEN certificate from the Bendix Corporation. This historic document was printed by the Northern Banknote Company and has an ornate border around it with a vignette of a man sitting next to a control panal with planes, trains, ships, rockets, and buses. This item has the printed signatures of the Company�s Chairman and Treasurer. American corporation founded in 1924 to manufacture automobile brake systems. Since 1982 it has been a subsidiary of Allied Corporation. The company is now an international manufacturer and supplier of automotive components, house-building materials, and other equipment. The company's founder, Vincent Bendix, himself an inventor, joined with French inventor Henri Perrot to manufacture brake systems in South Bend, Ind., in 1924; and by 1928 the Bendix Corporation was producing 3,600,000 brakes per year, chiefly for General Motors Corporation. In 1928 Bendix Corporation acquired control of Eclipse Machine Company, Elmira, N.Y., which had been producing Vincent Bendix' automotive starter since 1914. 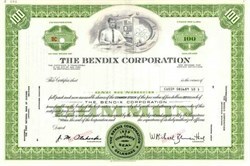 In 1929 the company turned to aviation products and changed its name to Bendix Aviation Corporation (not reverting to the name Bendix Corporation until 1960). From 1928 to 1948 General Motors was a major stockholder, but in the latter year GM disposed of all its remaining shares. 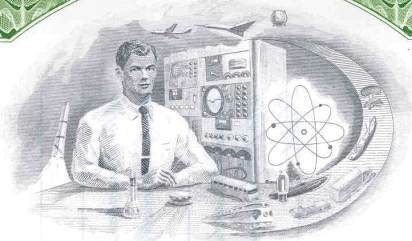 In 1999, AlliedSignal and Honeywell Inc. merged together.